A full colour map of the Kennet and Avon Canal and the River Avon suitable for both waterways and leisure users. This map gives detailed coverage of the Kennet and Avon Canal with emphasis on the waterways and information useful and relevant to users of the waterways without neglecting other leisure users. The map detail is complimented by information panels and photographs. A tourist map of the Kennet & Avon Canal and River Avon at 1:50,000, running from Bristol in the west to Reading and the junction with the River Thames in the east. There are detailed town plans at 1:12,500 for Bristol, Bath, Bradford-on-Avon, Devizes, Newbury, Hungerford and the centre of Reading. The map includes navigation and historical information, visitor moorings, marinas and boatyards, boat hire centres, facilities for the boat user, shops and distance markers. The National Cycle Route 4 and crossing routes are also shown between Reading and Bristol. Information for visitors includes tourist information centres, places of interest, pubs, nature reserves, parks, churches, long distance footpaths, public toilets and caravan and camp sites. The Kennet and Avon Canal is the most southerly broad beam canal in England. With a rich industrial hertiage, spectacular scenery, and abundance of wildlife it is a great way to explore a relatively unspoilt corridor of southern England. So whether by boat, bike or on foot it's well worth a visit. 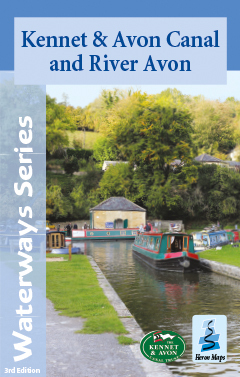 The Kennet and Avon Canal map is available to buy online or by telephone from our business partner, Guidepost. Click on the logo below to visit their store.